During the heyday of James Bond films, it seemed every successive 007 movie was tagged as “The biggest Bond of all.” Similarly, the principal critique of each new entry in the Harry Potter saga is whether it is the “most mature” or “darkest” Potter film yet. While devotees may prefer the childlike charm of the two Chris Columbus offerings, the visual skillfulness in Alfonso Cuarón’s Prisoner of Azkaban, or the post-9/11 zeitgeist of Order of the Phoenix, the truth is that differentiating between any two Harry Potter films is rather like choosing between Wonder Bread or Sunbeam: Each are satisfying, but at the end of the day, they’re both just white bread. Until now. Harry Potter and the Half-Blood Prince not only dramatically distinguishes itself from its forerunners, but also validates the series as a whole. In the able hands of returning director David Yates, this is the funniest, most visually sublime, and, yes, darkest addition to the Potter canon. You are taken in from the opening dissolve, in which Harry (Daniel Radcliffe), now trumpeted as the Chosen One, is caught in the crosshairs of Paparazzi flashbulbs, just starting to bear the weight of expectation and shielded only under the protective wing of his mentor/surrogate father-figure, Dumbledore (Michael Gambon). More than any other, this Potter film grasps the fact that the series’ true magic rests not in passageways, potions, and periphrastic spells, but in the relationships between the characters. Of course, there is the seminal trio of Harry, Ron Weasley (Rupert Grint), and Hermione Granger (Emma Watson), now steeping squarely in the hormonal whims of adolescence angst. At various points during the Quidditch matches, the flying broomsticks straddled by competitors vying for the affections of female onlookers conspicuously assume a phallic form. But, the story’s principal couple has always been Harry and Dumbledore, and their bond has never been more personal than here, taking on a heightened father-son air, even including Dumbledore making repeated causal inquires about Harry’s love life. Virtually the entire film is pitch-perfect, from the pacing to the visual effects to the best ensemble acting thus far in the series. In roles they have played since their preteens, Radcliffe, Watson, and Grint have matured as actors along with their characters, although still overmatched against their Royal Shakespearean Co. costars. Indeed, Gambon has made us forget Richard Harris, while Jim Broadbent steals the movie as the dotty, yet haunted Professor Slughorn. 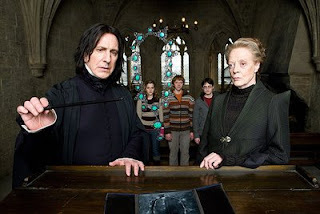 The real star of Half-Blood Prince, however, is Yates, an experienced television director who is already tabbed to adapt J.K. Rowling’s final installment, Harry Potter and the Deathly Hallows. Yates has taken hold of the franchise reigns so firmly that he is comfortable imprinting it with his own filmmaking style while also being given license to depart occasionally from Rowling’s literary blueprint. The happy result is a Harry Potter film that not only stands apart, but one you’d want to see again. That might be the most amazing magic trick of all.